A new spring Mosaic will set out to do perhaps the one thing in the sustainability realm that has not yet been tried at Dickinson: gearing students up to craft a new sustainability-driven curriculum. 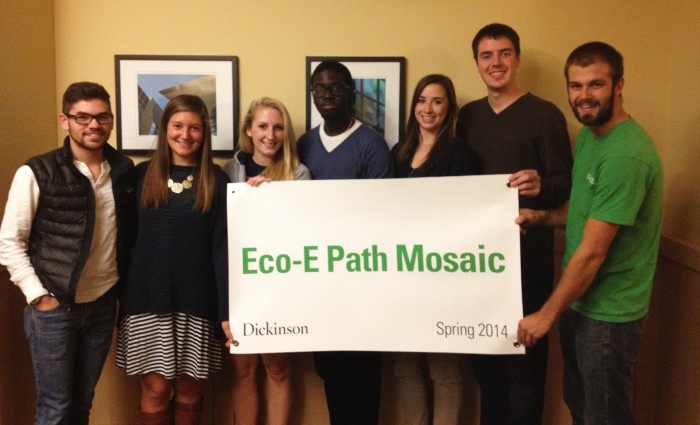 The Mosaic, which will focus on business sustainability and entrepreneurship, is called An Eco-E Path at Dickinson College, and it's led by Helen Takacs, assistant professor of international business & management; Emily Pawley, assistant professor of history; and Anat Beck, adjunct professor of international business & management. The Mosaic "has the potential to further differentiate the college while serving our students," Takacs says, noting how unique this program really is. "When I was writing the Mosaic proposal, I could not find another four-year undergrad program on sustainable entrepreneurship." Sustainable entrepreneurship, often referred to as eco-entrepreneurship, or eco-e, seeks to balance targeted economic benefits with environmental and/or social benefits, and it's something that Dickinson students are ready to embrace. "My focus is sustainable business," says Cyrena Shiland '14, "and I knew this would be a program that could totally encompass everything I've been learning and working on so far." For Joojo Ocran '17, a native of Ghana, an interest in entrepreneurship goes back as far as he can remember. "Entrepreneurship has been a big part of my life," he says. "It has been since my childhood, because my dad was the classic rags-to-riches story: He founded a corporation after being an orphan. So it's a mentality that's been built into me, a key part of me. And to apply sustainability to a business setting directly is something I'm excited about." As part of their research, the Mosaic students will be interviewing faculty and students at other educational institutions as well as students, faculty and administrators at Dickinson. The class will also be in touch with alumni currently involved in sustainability and entrepreneurship. "The vision we see is that the students will shape the curriculum based on courses we have now or based on courses they think we need to add," Takacs says. "We want the Mosaic to have a tangible, substantive outcome." She thinks this outcome, representing an interdisciplinary path forward, might be a minor, certificate program or concentration in eco-entrepreneurship. The drive, in the end, is to encourage and prepare students to make a real change in their world. The Mosaic's three courses and domestic study trips, including one to Arizona, aim to arm students for a future that needs big-picture action more than ever. "For me," says Justin McCarty '15, "leaving behind a path on which students can learn about ways to create a business that is financially stable, socially equitable and only leaves a positive imprint on Earth—there is no better way to impact future generations and help solve our collective [environmental] crisis."